Film screening followed by discussion. 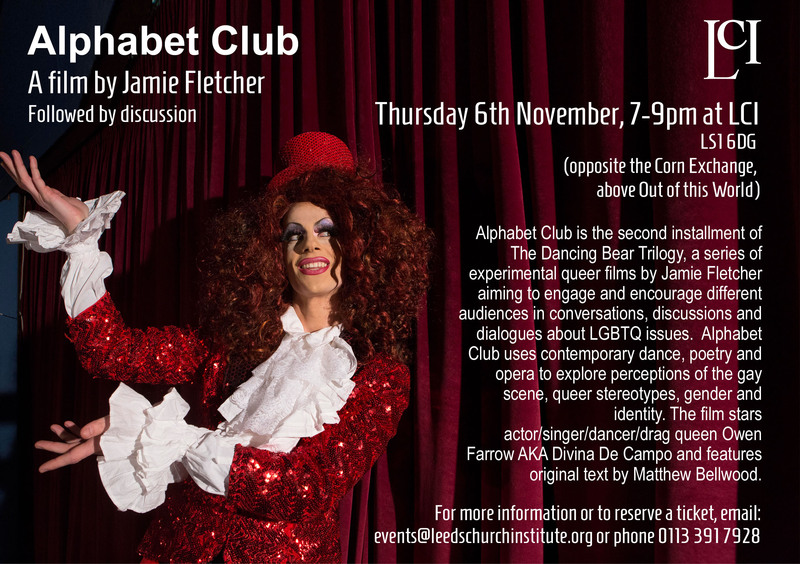 Alphabet Club is the second instalment of The Dancing Bear Trilogy, a series of experimental queer films by Jamie Fletcher, aiming to engage and encourage different audiences in conversation, discussion and dialogue about LGBTQ issues. Alphabet Club uses contemporary dance, poetry and opera to explore perceptions of the gay scene, queer stereotypes, gender and identity. The film stars actor/singer/dancer/drag queen Owen Farrow AKA Divina De Campo and features original text by Matthew Bellwood.